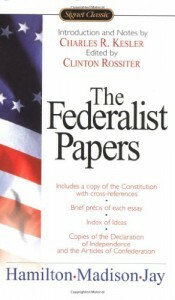 The Federalist Papers - Tolle Lege!. If your interested in this one, get this one when Audible has their two for one sale. It's definitely worth a half a credit for its line by line dissection of the American Constitution, good Age of Enlightenment arguments, and this makes for a much better listen than a read since there is a lot of redundancy between some of the essays and easier to tune out and focus on my bicycle riding during the redundant parts. It's hard not to like a book in which the authors assume the reader knows their Greek, Roman and 17th century European history inside and out. The writing from 1788 sounds as if could have been written today with surprisingly few archaic words or stilted phrasing. Good argumentation never goes out of style.